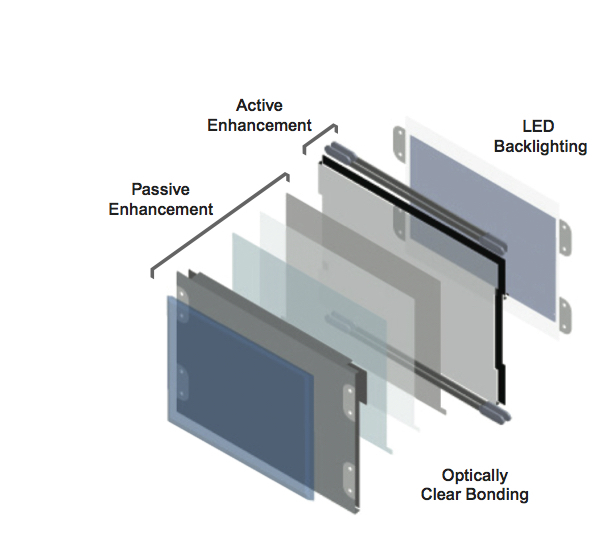 As a leader in optically enhanced display solutions, IEE is often approached by potential customers with an initial inquiry about our ability to provide a display that’s 1,500 nits or even brighter. When we ask why they need such a bright display most common answer is "we need good image quality under all lighting conditions." Despite what many believe, buying a display with the most powerful backlight you can find does not guarantee a quality image even in full sunlight. Increasing the strength of the backlights attempts to increase readability by overpowering the ambient light with the brightness of the display. That approach has drawbacks. Bigger, brighter LEDs increase the display’s power consumption, increase heat generation and tend to result in a thicker display. More importantly, increasing backlight power raises both the black luminance and white luminance thus reducing contrast, which is the real issue with viewability under bright lights. By taking the time to understand what our customers are trying to do, IEE delivers the right engineering solution rather than just throwing lumens at the problem. Of course, if you really do need raw brightness, we can do that too. We can source and install any backlight available on the market.